We have reached our first year of blogging, self sufficient and sustainable learning and experimenting. Hooray! It has been a great adventure and everything we have attempted has been good fun, relatively cost efficient and sometimes hard work. We have learnt how the generations before us would have made cheese, built and worked beehives, grown vegetables the old fashioned way and brewed cider, amongst other things. Its surprising how satisfying it can be when you put the effort into making life a little more simple and self sufficient (something I have never felt when buying from a store). Loaded up and on our way out! The most exciting thing now however, is that the road to Raelands is getting shorter. University graduation was the other day, work is finished, all our worldly possessions have been thrown into grannies shed and we are just about to jump on a plane for Bhutan and India. Hopefully after this the road to Raelands will come to an end and we will begin life on the farm. Before we sign off for a little while though I would like to give a few notes about what was a success for us. 1. Dairy products – Butter and yoghurt were easy and relatively quick for us to make so they are in the weekly recipe book. Farmhouse cheddar is probably the only other dairy product we would consistently make and it would be made in large batches so we don’t have to make every week. 2. Brewing – I had mixed results with cider brewing. The first batch was good but the second was really bad so I think I will try some ginger beer and root beer recipes next year and maybe brew some cider from real apples one year. Alcohol isn’t that important to us though, so it’s not much of a priority. We did have success with grapefruit and lemon cordial however, which were simple to make and great throughout summer. 3. Honey and beekeeping – I really enjoyed building my own Warré hives because I had the time and had just attended a course so the info was still fresh in my mind. In the future I am considering building Kenyan Top Bar hives because they are cheaper and less time consuming to construct. 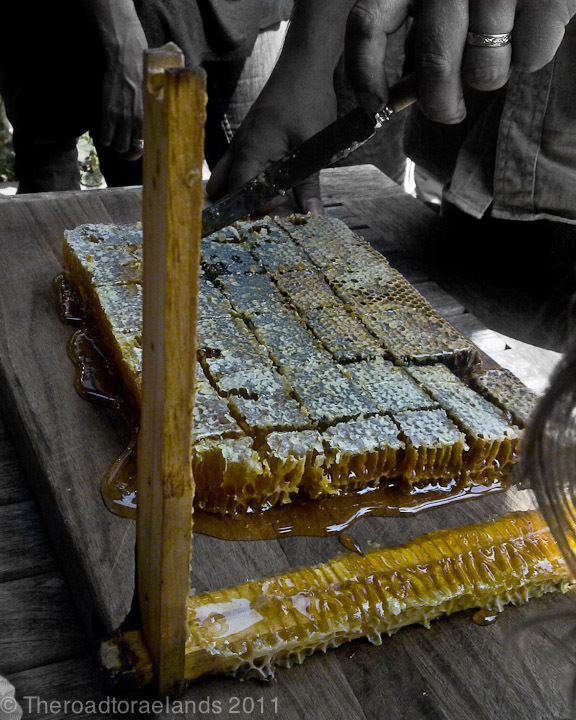 More natural beekeeping methods don’t produce as much honey as conventional beekeeping but for us this is not important because bees are more crucial to our pasture pollination than for making money from honey. 4. Vegetable garden & orchard – The organic garden we established was more successful than I expected so we hope to establish a 4 bed 10×1.5m system on the farm to produce enough veg for our family and possibly a little extra to sell at local farmers markets. The main goal though is to provide most of our veg, year round, for our own consumption. Luckily over the years dad, his dad, his dads dad and I have sporadically planted various Peach, Lemon, Grapefruit, Orange, Fig, Mulberry and Pear trees and each year we aim to build on our orchard plants and hopefully get around to netting them. 5. Meat and protein – The aim for us in the short term is to purchase some laying chickens and to grow out a steer for meat as we eat a lot of eggs and quite a lot of red meat. The above may all sound like a lot of work but if we are to produce enough food for our family from our farm we will greatly ease our reliance on income to feed ourselves. More funds can then be spent on the dairy business and family related expenses. Merry Christmas to you all, thanks for your comments over the past year, watch this space and we will be back with fresh ideas in 2013. Cheers. 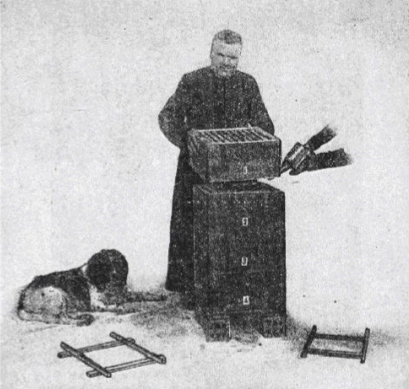 Abbé Émile Warré, checking 'The People's Hive' with his friend, the cocker spaniel 'Polo' - Photo from "Beekeeping for All"
Abbé Émile Warré (1867-1951) was a beekeeper in France during the late 1800’s and early 1900’s. Over 30 years of his time, as an apiarist, was spent studying 350 different hives of different systems, leading to the eventual development of ‘The People’s Hive’ (now often referred to as the ‘Warre’ hive). His book ‘Beekeeping for all’ was translated into English by Patricia and David Heaf in 2007 allowing non French speaking people to gain access to this wealth of knowledge. It is suggested in ‘Beekeeping for all’ that it is unwise for a novice to experiment with different hive types, as 10-12 hives are required per type, which should careful be observed over 10 years to gain a real grasp on the functionality of each. Having considered this I read a little on each type of system currently being used in Australia and decided that ‘The People’s Hive’ should suit my purpose well. I found that the main restriction with The People’s Hive/Warré system here in Australia is that it has only recently been adopted by a scarse few commercial apiarists, this may be due to the only recent translation of ‘Beekeeping for all’. However, during my university holidays I was lucky enough to find and attend a natural beekeeping course run by Tim Malfroy of Malfroy’s Gold, which was based on the Warré system. This then lead to the building of two hives. I found the Warre construction guide at the beespace invaluable to the building of my hives and generously provided for free. I had an issue though. I wanted hive components that I hadn’t seen for sale before, in particular hive boxes with observation windows and I didn’t want to spend a fortune on them. 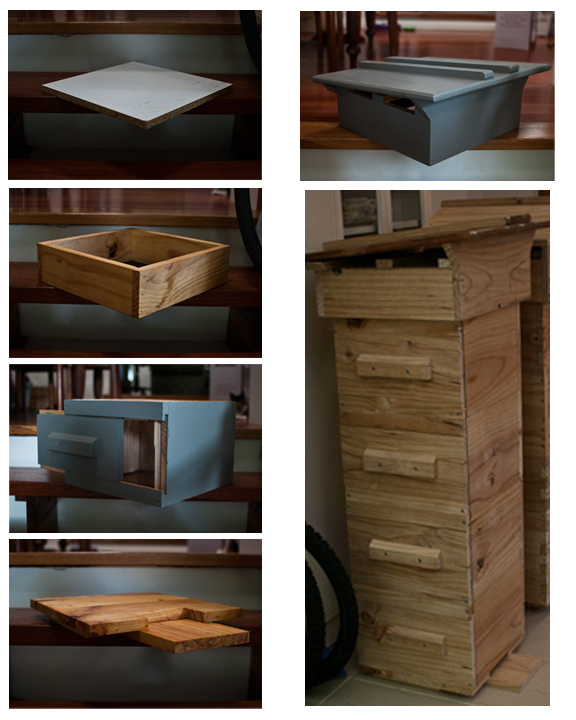 The People’s Hive comprises of a base, hive boxes, top-bar removable frames, a quilt box and a roof. The hives here are made from radiata pine due to its affordability and weight. The closest measurement to Warre’s 20mm thick timber in Australia is 19mm thick boards with a width of 240mm. As long as you can achieve dimensions close to this it doesn’t matter if you go a little thicker or wider. The base (floor) – 1 x Bee landing board 420(L) x 160(w), 1 x floor plate 350mm x 350mm (this could be cut out of 2 pieces and sits on top of the landing board), 2 x short legs 210 x 30 (these legs are screwed/nailed parallel to the land board to join the two base plate pieces and create a more stable floor. The landing board protrudes 70 x 160 mm out the front of the base and the entrance gap for the bees is 120 x 40 (d). This entrance is decreased during summer with a board and an opening cut 120 15 (d). During winter another board can be installed, this will have a gap cut 70 x 7.5 (d) to prevent rodents entering the hive. The hive boxes – I have added observation windows to my hives because I would love to be able to check the bees and show friends and family without opening the hives. I have seen other designs, however, I had the tools available to build slide window covers. If you would like to build standard hive boxes a lot less equipment is needed and you should ignore the sliding window. For the standard hive box you simply need 2 x 240 x 19(T) pine boards that measure 310 (L) and 2 that measure 350 (L) (external measurements on all components except the roof will measure 350×350). The short sides need to have a rebate cut into the top of them 12mm x 11mm (d) to allow the top bars to sit on them (This is for Australian timber sizes). Note: see photo below, the short side with the rebate is butted against the long side. This leaves adequate room for 8 frames in each hive box. The short sides can then be glued and fastened with screws or nails to the long sides. 2 x short handles should also be screwed to the sides that run parallel to the frames (the sloped top of the handles allows water run-off). 240 x 350 x 3mm(T) perspex sheeting per hive (must be drilled and screwed), enough timber for a window cover 190 x 350 (L) and 2 window slide frames 40 x 350 (L) (Leave a gap when rebating the windows to allow for swelling). The window is only on one side of the hive box and by having it rebated has allowed me to put one window on each hive box looking side on to the frame (the handle side), whereas other designs I have seen only allow you to look at the ends of the frame. I am yet to test this design and I hope that the orientation of the window is ok. My main worry is that there will be too many bees to see the comb from a side aspect. The Quilt box – The quilt boxes external measurements are 350 (L) x 350(w) x 100 (h). Its sole purpose is to be filled with straw or sawdust to allow any condensation in the hive to pass into it and become absorbed rather than dripping on the bees. It should be fitted with a single layer of fly/insect mesh on its underside so that the bees can’t chew into the box. Below the quilt box will also sit a single layer of hessian on top of the hive box (not seen in the components photograph), this hessian square allows the beekeeper to gently observe the hive. Quilt box board – This board is a simple square board that sits on top of the quilt box 350 x 350 x 10 (t) to protect its content from moisture, rodents, etc. If you use a piece of white coated, weathertex type board you can write down your hive observations each time the hive is opened (Use permanent marker). The hive roof – The gabled hive roof construction can be found at the beespace construction guide, however I decided to build one sloping roof for interests sake. I used the design in ‘Beekeeping for all’ and found it quite easy to construct. The roof top dimensions are 1000 x 1000 x 19 (t). The 2 sides measure 360 (L) x 150 – This depth is useful to keep in mind as it ensures the quilt box and some of the top hive box is covered by the roof frame. The lowest end piece is 400 (L) x 150 and the high end piece is a little more tricky as it is 150 x 400 (L) until having to spread out to meet the edges of the roof top (this creates the slope). I angled and raised it 60mm higher, which seems like a good angle to shed water. The final step to finish is a couple of boards spanning across the frame but below the roof (these boards sit on top of the board above the quilt box, they also make the roof sit level. 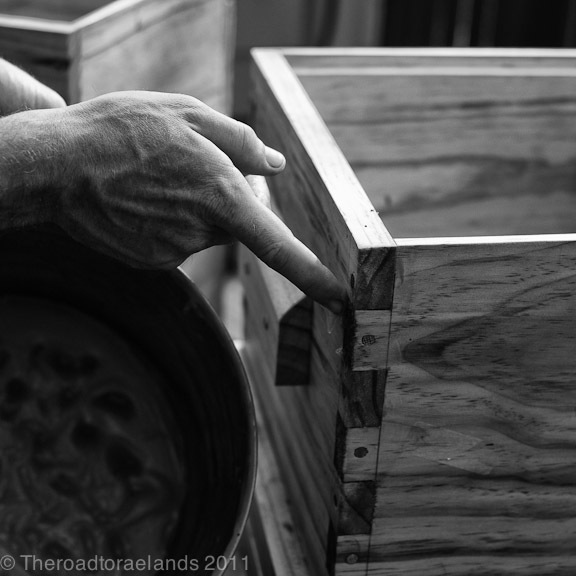 Timber treatment – I treated my hives with a 15:1 linseed oil beeswax mix heated to 75·C and painted on. You could stop at this stage or you could also treat the hives with two coats of low sheen, low toxic paint. Well I hope I have been somewhat clear about my slightly modified design of ‘The Peoples Hive’. 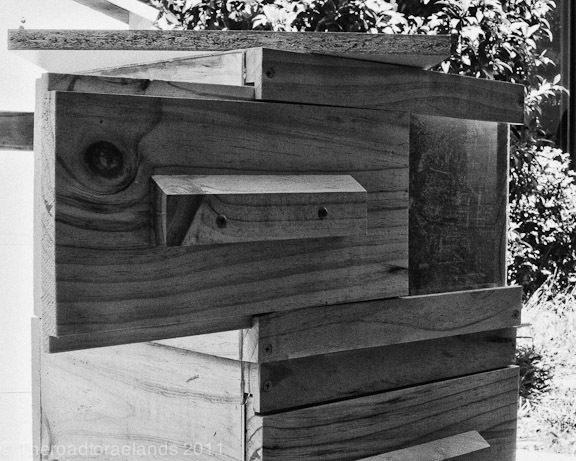 This hive is not at all different in function from Warré’s original, however it is simply adding some modern touches to make observation a little less disturbing for the bees. 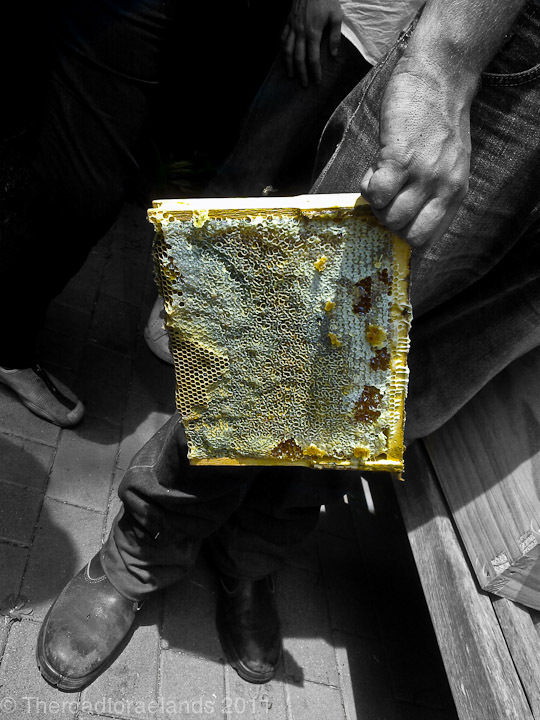 If you would like more information on natural beekeeping there are some great websites and blogs around, such as The Barefoot beekeeper, ‘beekeeping for all’ , The natural beekeeping trust, natural beekeeping blog, bee natural, A year with Warre hives. If you live in Australia and are interested in attending a course check out Malfroy’s Gold, as Tim is one of few commercial Warré hive apiarists in Australia. I found the course to be interesting and practical and without attending it I feel that I wouldn’t hold the skills or confidence to give ‘natural’ beekeeping a go. Bees are truly amazing insects. As a child growing up on the farm I occasionally saw the clump of white boxes sitting in a neighbouring paddock, however I never really knew how important bees were for the pollination of many of the plants we rely on for our survival. A study that was conducted in 2006 by CSIRO scientists from England, Germany, US and Australia found that one in every three mouthfuls of food we consume comes from insect pollinated crops. This study was conducted in over 200 countries worldwide and found that 87 of the 110 global food crops we rely on require animal pollination (to varying extents). Personally I found these figures astonishing, especially when most of the time we regard bees purely as creatures that sting and give honey. This blog post is not aimed at commercial production of honey but rather a way to introduce bees into your backyard, garden or farm for the purpose of plant pollination and honey for personal consumption. A natural way to keep bees? 1) The inside of the hive is observed less frequently (As little as 2-3 times a year) thereby reducing chilling of the brood, which can lead to weaker colonies that become more susceptible to disease. 2) The hive box is square and of a dimension where the bees are easily able to regulate the internal hive temperature during colder periods (the larger hive boxes of conventional hives entail a large amount of air space that requires more energy to heat). 3) The hive is expanded from below (hive boxes added) and the honey harvested from the top. This mimics a tree trunk. This may sound crazy but bees that build colonies in hollow trees draw comb downwards during a honey flow, they then move up to their honey stores to feed during winter. 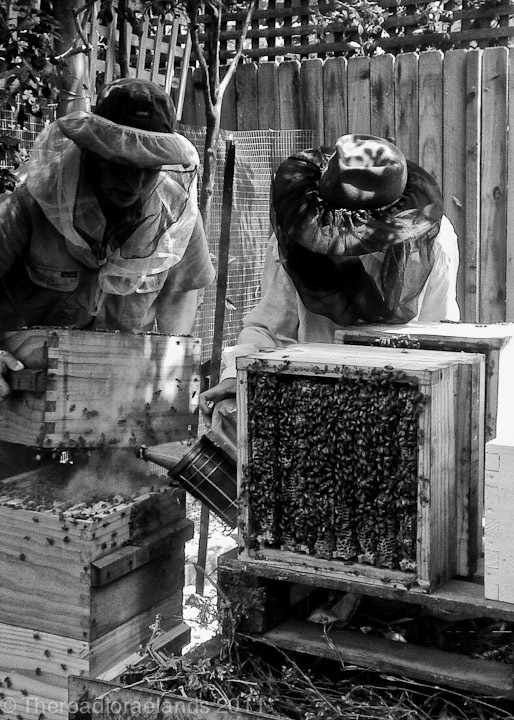 By mimicking this action we can let the bees draw comb down through the hive boxes and take the top boxes off after the comb full of honey has been capped and the brood has moved into lower boxes. 4) Less equipment and time is needed to prepare the hive – Frames or top bars can be used and are fitted with starter strips rather than foundation that requires wiring (conventional hives). This allows bees to natural form their own comb to their needs. 5) The more natural ‘peoples hive’ system produces less honey – From a commercial standpoint this is unfavourable, however from an amateur beekeepers perspective this is something that leads to an eventual saving in time, money and bee health. Less disease is apparent due to decreased disturbance of the hive (The bees regulate the inner temp of the hive at a constant 35°C and whenever we observe the hive the bees have to work hard to raise the temperature again) and less time is needed to manage the hives. This is not to say that careful observation of hive health and the monitoring of activity at the hive entrance is not necessary). As a sugar, honey is hard to beat. The form of glucose that is found in honey can immediately be assimilated and taken into the blood stream, whereas artificial sugars use invertase that is released from the stomach and intestines. This invertase is also used to break down fats and starches, therefore by consuming artificial sugars we increase the demand on our organs. Honey also contains formic acid, which makes an effective antiseptic. There are many health benefits to honey and many practical uses for bees wax. To learn more about ‘the peoples hive’, natural beekeeping and bees take a look at the free ebook “Beekeeping for all” by Abbe Warre, The bee-friendly beekeeper by David Heaf and the biobees website. We will hopefully be establishing a few “peoples hives” on the farm in the future, with two already built and ready to go. Having said that it is certainly possible to become a beekeeper in an urban environment with many councils allowing 1-2 hives per backyard. I will add another post to the beekeeping category soon about how to build your own “peoples hive” aka Warre hive with observation windows. If you are interested in attending a natural beekeeping course and you live in Australia check out the Malfroys gold website and make sure you grab a copy of the free ebook by Abbe Warre – Beekeeping for all. I have no commercial interests in this blog therefore any recommendation I am giving are purely based on positive experiences.